"I'm getting a new Android! How can I move my WhatsApp chat history over? It really contains a lot of important information!" Featuring on group/voice/video/text messaging, Geo-location and fully compatible with Android, iOS, Windows phone, Nokia, Blackberry, WhatsApp plays an indispensable role in our daily communication. Hence, there's every need for us to learn how to backup WhatsApp conversation on Android as the following 6 situations can easily wipe WhatsApp chat chats. Reinstalling WhatsApp erases all chat history. Factory reset wipes all contents including WhatsApp chat history. Android OS update that deletes all WhatsApp conversation. ROM flash, virus attack, firmware corruption and other unknown reasons. Fortunately, I happen to know 2 free ways to backup and restore WhatsApp chat history on Android. See the details below. Tips: Way 2 is highly recommended if you want to backup or restore part instead of the whole WhatsApp conversation. In fact, WhatsApp for Android automatically creates daily backup of all chat history and stores them in /WhatsApp/Databases folder on your phone's internal memory or MicroSD card. Attention: This way would backup the whole WhatsApp chats including those unnecessary ones which will eat up your phone space, and restoring such backup would overwrite current WhatsApp data making them irretrievable. 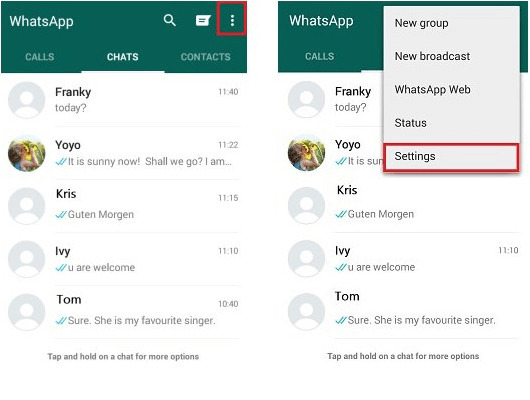 To backup the up-to-date WhatsApp conversation, you can navigate to WhatsApp >> Menu Button >> Settings >> Chat settings >> Backup conversations to back it up manually. After that, you can easily restore WhatsApp chat history by reinstalling WhatsApp and tapping "Restore" when prompted to restore your message history whatever causes losing WhatsApp chats on Android. Alternatively, you can also turn to Android WhatsApp Recovery, the well-known freeware that not only enables you to selectively backup WhatsApp data (chat history, pictures, messages, videos, etc.) from Android to PC but saves phone space to optimize WhatsApp performance as well. See the tutorial below to learn how to perform WhatsApp Android backup and restore with the freeware. Step 1: First of all, freely download Android WhatsApp Recovery and launch it after installation. 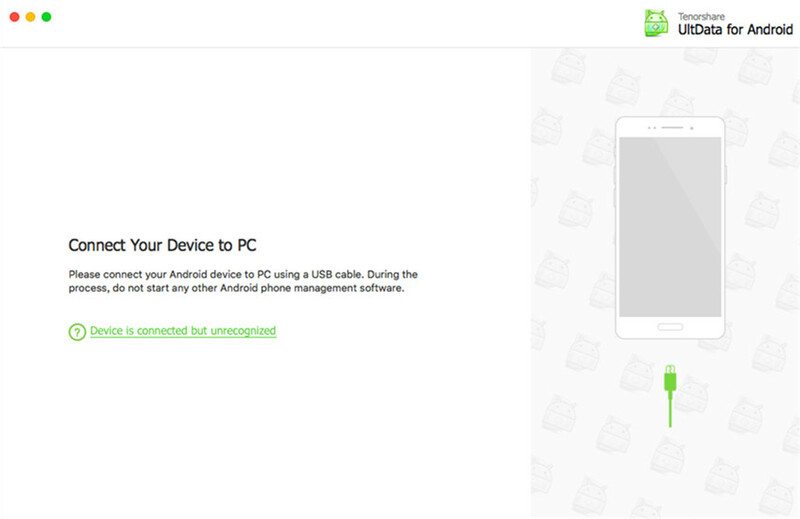 Step 2: Connect your Android device to PC and then the software will display both existing and lost WhatsApp text messages, photos, videos and audios after automatic scanning. Step 3: After previewing, you can freely and selectively choose your desired conversations, pictures, videos, etc. from WhatsApp. Then click "Export" to start backup WhatsApp chats. After above steps, all the chosen WhatsApp data on Android would be retrieved to local PC (a folder either by default or specified by you). As for how to restore WhatsApp chat history from PC to Android, you need to navigate to the folder of WhatsApp backup files and use the traditional copy-and-paste way to transfer it to the WhatsApp folder on the internal memory card of your Android device. These are the top 2 ways to backup and restore WhatsApp on Android totally for free! Select either one that facilitates you more. And FYI, the article how to recover data from Android device may help you out if you suffer from destructive data loss from Android device.